Since February 2nd the passengers of Płock’s city transport can use an open internet network free of charge. The hotspots have been enabled in 10 buses operating on the most frequently used lines. The internet can be utilized by the passengers using smartphones, tablets and laptops. 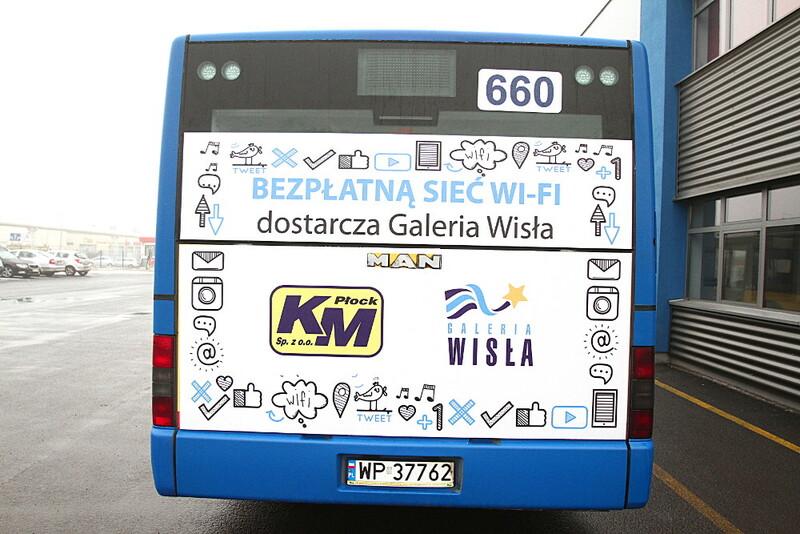 Implementation of the WiFi network in municipal buses in Płock is a result of the partnership between Płock and Galeria Wisła Shopping Mall. It aims to increase the comfort of commuting for its inhabitants by providing them free access to wireless internet. In order to accomplish this goal, the buses utilize technologies provided by Social WiFi, which delivered a specifically designed network infrastructure that becomes active the moment the engine starts running. The solution also allows both partners to communicate with the passengers through an elaborate system of messages and the ability to display multimedia content. Social WiFi makes it possible to immediately display information about events in Galeria Wisła Shopping Mall, as well as timetable changes or current air quality in Płock. Using the free WiFi network is as simple as choosing the network called KM Płock from the available ones, accepting the terms and conditions and accessing the internet, says Magdalena Michalska, Marketing Manager of Galeria Wisła Shopping Mall. Płock, thanks to Galeria Wisła, is one of the first cities in Poland where municipal buses have been equipped in hotspots. So far, this has mostly been prevalent among large regional cities such as Warsaw, Łódź or Białystok. Each of our buses is clearly labeled, so that the passenger is informed about the availability of WiFi the moment they enter the vehicle. It makes communicating with the passengers much easier for us, simultaneously giving the the ability to use free internet, thus increasing their comfort. Thanks to the service we can also ask the passengers about their satisfaction from the municipal transport services or about any other matter, says Janusz Majchrzak, CEO of Płock Municipal Communication. Płock becomes the first city in Poland to utilize smart WiFi in municipal transport, which makes us very excited. We continue to develop the services of WiFi marketing for public transportation, adds Artur Racicki, CEO Social WiFi. The service is currently available in 10 public transportation buses. The vehicles providing free WiFi have received special labels on their side windows and doors for passengers’ convenience. Service login occurs by using an e-mail or social media account, making it intuitive and only taking seconds. The program of providing free hotspots in buses in Płock, sponsored by Galeria Wisła Shopping Mall, will last at least until January 31st, 2018.